In the 1850s and 1860s parties of assisted British emigrants arrived in Canada to work as servant girls. These young women paved the way for British child migrants now known as Home Children. Taken from situations of dire poverty by child savers in Britain, up to 100,000 Home Children were placed with Canadian families between 1869 and the late 1930s.1 A few were adopted into families, but the norm was to place in homes them as servants. Andrew Doyle, a senior inspector sent to Canada by the British Local Government Board in 1874, called in vain on the Canadian government for a program of official inspection of the children in their rural homes.2 Canadian authorities never did exercise effective oversight, and this failure contributed to the suffering of vulnerable children. Working on a book on the inland immigration service in Upper Canada/Canada West from 1829 to 1867 has led me to consider the role of immigrant agents as mediators between the poorest immigrants and their employers. Studies of Post-Confederation child emigration highlight the contentious subject of assisted emigration and the political and social factors that allowed child migration to expand in Canada as the background for the later neglect of child migrants.3 The failure to inspect fits into this narrative with an added reason for neglect in the demands and difficulty of visiting farms widely separated and often inaccessible. When British social reformer Maria Rye introduced her first parties of children to Ontario in 1869, she found a ready model for her system of reception and distribution in the work of government inland agents with indigent immigrant newcomers. A discussion of the system in use when she arrived helps to explain why Canadians sided with the informality of Rye’s distribution and rejected Doyle’s recommendations. The inland immigration service in Canada West in the 1850s and 60s had evolved considerably from its origins in the Crown Lands Department of Upper Canada. Land agents in the 1830s doubled as immigrant agents to supervise and assist selected British civilian immigrants and discharged military personnel to locate on crown lots with terms of purchase and aid adjusted to their poverty. To address the cholera epidemic of 1832, Lieutenant Governor Sir John Colborne added stationary agents along the route upriver from Montreal into the Great Lakes. After the service was separated from the Lands Department, the stationary agents proved the more durable option. In the 1840s, agents in fixed stations received immigrants on behalf of government. Most “girls” were teenagers 14 or older or else in their early 20s. Those who left an institution such as an industrial school or a workhouse had at best temporary supervision on their journey by a matron. If the sponsors contacted Buchanan at Quebec, they expected Canadian agents to meet their girls on their travels inland at Montreal, Ottawa, Kingston, Toronto, or Hamilton and to forward them to waiting employers. Although informal arrangements defy a ready estimate of numbers, there is no doubt that these women occupied substantial amounts of agents’ time and attention. As indigent immigrants of the current year, these girls fit agents’ mandate to assist a migrant’s travel inland from the Port of Quebec. Although a strong demand for servant girls in Canada West encouraged the agents to welcome them as wage earners, the novelty of their situation caused agents unease and extra duties. At Toronto in 1849, Hawke chose to give young Jesse Ross the benefit of the doubt when she tearfully denied accusations of theft. He forwarded her to Hamilton in the belief that his free ticket leading to a job was the one chance at redemption for a good-looking girl, unprotected, and “without a friend in the wide world.”4 Once a girl was on her way to a place, government intervention ceased. Where he could, Hawke enlisted members of the Roman Catholic clergy to help arrange hiring for Catholic Irish girls, appealing to them as the “best and safest advisors” to young women “unaccompanied by any natural protectors.”5 Any further interest a priest or others of his contacts took in the girls’ future was a personal matter unconnected with government. Fifteen years later, his successor as Toronto agent, John Donaldson, handled parties of arriving girls as routine. They were easily placed at once, Donaldson wrote in 1866, and “only if you listen to them whine all the time [will they] keep you busy.”6 Especially from farmers, the demand for servant girls was greater than for any other class of emigrant received at the agencies. Agents lamented receiving girls who “cannot milk; nor do any of them understand farmhouse work; another thing is, they all seem unwilling to go to the country, although it would be better for them.”7 In 1865, resentment of assisted emigrants unwanted at home coalesced around a group of some 70 “Limerick girls.” Sent by the Limerick Poor Law Union, these workhouse girls added drunkenness and defiance to incompetence to become a public example of all that might go wrong. Despite a vigorous defence of their selection for good character mounted in Ireland, nuns at Montreal found them unmanageable, the Kingston agent was shocked to see them in broad daylight drunk and cavorting with soldiers on an inland steamer, and receiving communities had a rough time with them.8 Publicity ensured attention from politicians. Library and Archives Canada, MIKAN 447 432, “Some of Miss Rye’s Emigrant Girls,” Canadian Illustrated News, 1 May 1875, 281. McGee’s letter had a vague threat of rendition, and the clerk of the Irish commissioners suggested keeping the girls at home where they were less at risk. Buchanan revealed the cracks in the Canadian case with his hope that Irish workhouses would not be deterred in sending girls in the future.11 At the height of seasonal demand the need for servant girls was so great that they did not need skills to find a place. In Ireland, workhouse officials took on the cost and trouble of assisted emigration because they could not place the girls at home.12 Canadian politicians settled for making the point with major sponsors that they must without fail reimburse the travel costs in Canada borne by the agents of the inland service. They left untouched the underlying problems revealed in agents’ correspondence of hiring, which was often unsatisfactory to both employer and servant. On first hearing in 1869 of Maria Rye bringing “young children” from Boys and Girls Homes to Toronto, John Donaldson, now the Dominion agent at Toronto, was strongly opposed on the grounds that Canada needed first to look to its own orphans.13 By 1875 he had changed his mind. He wrote her an effusive letter of support in response to Doyle’s critical report on Rye’s work in Canada.14 In the late 1860s, Donaldson and his fellow agents had their staff reduced and budgets cut as their department reduced the assistance available for poor immigrants. Rye, and Annie Macpherson who was also included in Doyle’s review, had proved themselves by relieving immigrant agents of burdensome duties. They provided supervision during inland travel, and by establishing transition homes they solved for the agents the yet more difficult problem of housing the children until they could be sent out. The duties of pre-Confederation agents did not take them past first contact with the employers of servant girls. The subject of inspection of these homes was never raised. Rye and Macpherson relied on their networks of personal contacts and volunteers to look out for the children’s welfare in the community. In 1875, members of the Parliamentary Select Committee on Immigration and Colonization and the press supported Rye and condemned as interference Doyle’s proposal for rigorous inspection by appointed officials. Rye had won wide support by tailoring her scheme to meet Canadian needs and expectations. Wendy Cameron has written two books in a collaborative project on the Petworth project of assisted emigration: Wendy Cameron and Mary McDougall Maude, Assisting Emigration to Upper Canada: The Petworth Project 1832–1837 and Wendy Cameron, Sheila Haines, and Mary McDougall Maude, English Immigrant Voices: Labourers’ Letters From Upper Canada in the 1830s, both published by McGill-Queen’s University Press in 2000. She has returned to the subject to investigate assisted immigration in Canada and the government agents whose aid from the 1830s to the 1860s influenced the first destination of many thousands of newcomers. Library and Archives Canada, “Home Children 1869-1932,http://www.bac-lac.gc.ca/eng/discover/immigration/immigration-records/home-children-1869-1930/pages/home-children.aspx; Constantine, Stephen. “Child migration: philanthropy, the state and the empire,” Lancaster University, https://www.history.ac.uk/ihr/Focus/welfare/articles/constantines.html. Joy Parr, Labouring Children: British Immigrant Apprentices to Canada, 1869-1924. (Toronto: University of Toronto Press 1994) 32; Roy Parker, Uprooted: The Shipment of Poor Children to Canada, 1867-1917 (Bristol: University of Bristol 2010) 49-55, 166. Parr, Labouring Children; Parker, Uprooted; Neil Sutherland, Children in English-Canadian Society: Framing the Twentieth-Century Consensus, (Toronto: University of Toronto Press 1976); Marjorie Kohli, The Golden Bridge: Young Immigrants to Canada, 1833-1939 (Toronto: Natural Heritage Books 2003). Archives of Ontario (hereafter AO), RG 11, 1-0-3, 447-8, A. Hawke to A. Buchanan, 6 November 1849. AO, RG 11, 1-0-4, 167, A. Hawke, Circular sent to priests at Hamilton, St. Catharine’s, Niagara, London, Ingersol, Cobourg, and Belleville, 11 April 1854. AO, RG 11, 1-0-6, Donaldson to Buchanan , 9 April 1866. Province of Canada, Sessional Papers 1863 [hereafter SP], No. 4, App. 6, James Macpherson, Kingston, Annual Report for 1862, 18 December 1862. SP 1866, No. 5, T.D. McGee, Minister of Agriculture, for 1865, A.C. Buchanan, Report on Immigration for 1865, Appendix 6, 23-32, Copy of correspondence … in relation to the conduct of the Limerick Union girls; Dympna McLoughlin, “Superfluous and unwanted deadweight: the emigration of nineteenth-century Irish pauper women,” in Patrick O’Sullivan, Irish Women and Irish Migration, Vol. 4, The Irish World Wide, (London: Leicester University Press, 1995) 66-88. SP 1866, No. 5, McGee for 1865, 11-12. McGee wrote from his hotel in London, England, 10 June 1865. SP 1866, No. 5, Appendix 6, 23-32, Copy of correspondence….Limerick Union girls. Ibid. ; Buchanan, Report for 1865, 4. McLoughlin, “Superfluous…deadweight,” uses an estimate of over 50,000 Irish pauper women assisted to leave Irish workhouses for North America between 1840 and 1870. AO. RG 11, 1-0-6, Donaldson to Joseph Charles Taché, deputy minister, 22 April 1869. Joy Parr, “Rye, Maria Susan,” in Dictionary of Canadian Biography, http://www.biographi.ca/en/bio/rye_maria_susan_13E.html. Canada. Journal of the House of Commons, 1875, Appendix No. 4, First Report of the Select Committee on Immigration and Colonization, 32, Donaldson to Rye, 29 March 1875, placed in evidence by Miss Rye. 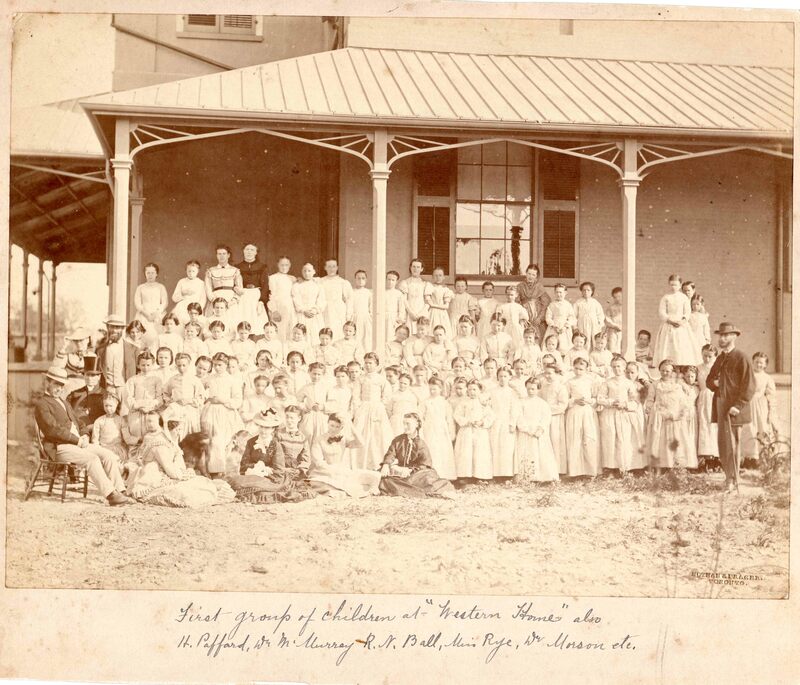 Featured image: Maria Rye’s First Group of Children at her Western Home . Courtesy of the Niagara Historical Society and Museum.